I have a slight addiction to anything buffalo, including anything buffalo chicken related. My friends usually give me a hard time because I just can’t. step. away. from. the. buffalo. Like hook me up to an IV of buffalo sauce and I’m golden. (I’ve also passed this addiction down to my children.) So of course, when I transitioned to the Paleo lifestyle one of the first recipes I needed to make Paleo friendly was my buffalo chicken! Luckily, there’s not much adjustment needed here other than the breading. Thank the heavens for tapioca flour! Seriously, these are super simple. 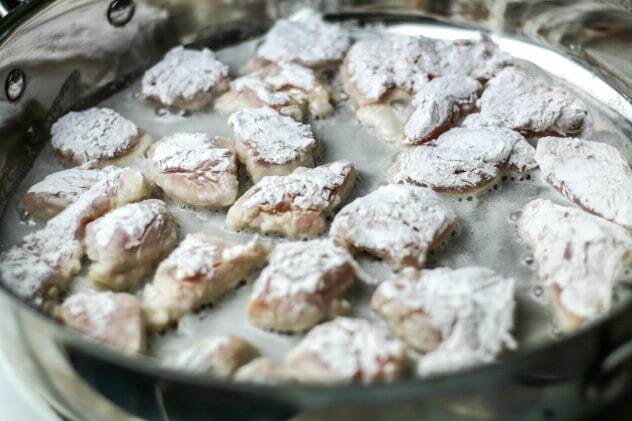 Grab some boneless chicken (hormone free, of course), tapioca flour, egg (optional) and coconut oil and these suckers are ready to cook. Sometimes I leave them in strips, sometimes I cut them up into bite-sized pieces, like in this recipe. I think the kids think they’re eating more with the bite-sized pieces, and when you’re feeding a herd of teenage boys this is a good thing! You can choose to either dip these in egg prior to the flour, just depends on how thick you want your breading. For me, it depends on my mood. Sometimes I don’t want to hassle with the egg step. For this recipe I opted to just coat the chicken pieces in tapioca flour and then fry in unrefined coconut oil. You could also bake these, whatever you prefer. Voila! I could eat these every day, multiple times a day. I’ll whip up a batch of homemade Paleo ranch, or in this case homemade Paleo dill dip, both of which are dairy free and Paleo approved! 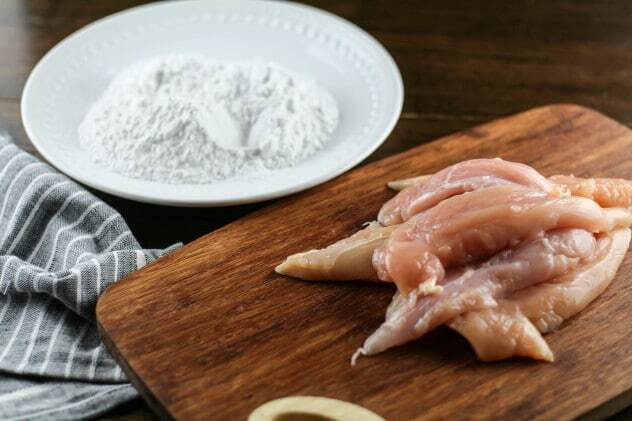 Cut chicken tenders into bite-sized pieces. Melt 2 tablespoons coconut oil in skillet on medium heat. 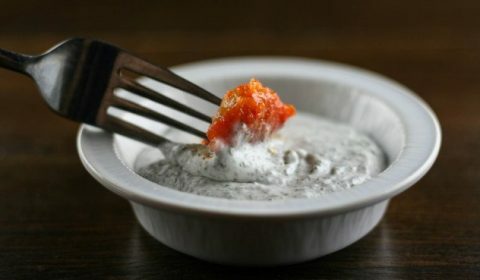 If using egg, dip the chicken bites first into the egg, then tapioca flour, then place into coconut oil to cook. Continue until all pieces are coated and in the skillet cooking. While chicken is cooking, add Frank’s hot sauce to pan with butter and melt over medium-low heat. Turn the chicken pieces occasionally until thoroughly cooked. Add additional coconut oil as needed. 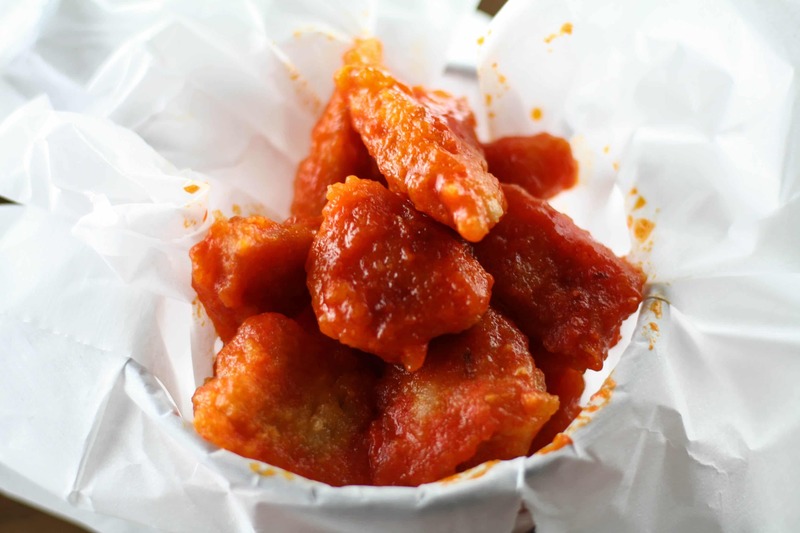 Once chicken is finished, remove from skillet, dip into hot sauce until thoroughly coated and remove. For dill dip, blend all ingredients in a food processor or blender and serve immediately, refrigerate any leftovers.